Posted by davelawrence8 at 12:10 pm on May 18th, 2012. No comments... » Categories: lowend, macs. Tags: 1984, apple, iron man, mac, macintosh, tony stark. Subscribe via RSS. Matt over at Matt’s Macintosh has a lovely office setup. Posted by davelawrence8 at 8:13 am on February 27th, 2012. No comments... » Categories: lowend, macs. Tags: 1984, classic, mac, macintosh, setup. Subscribe via RSS. If you checked out today’s earlier post, you can tell I’m a big fan of April Fool’s Day. Always have been. So last night I crept back into work after hours and installed a “new” computer for one of my coworkers. A Mac SE. 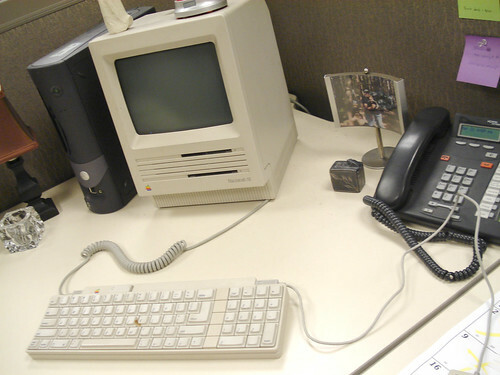 I came up with the idea months ago, but I originally meant to replace all of my coworkers’ workstations with vintage Macs – all four of them. The logistics, however, made me think twice. Lugging two Mac SEs, a Quadra, and an LC 550 up the office stairs didn’t seem worth it. So I pulled some other fun pranks instead. Someone caught me in a woman’s hat at a recent event. One of my coworkers printed off 10 copies and posted them all over the office. It was like 1984, with Big Brother’s face plastered everywhere you went. The above spot was my favorite, however. 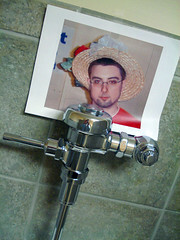 My boss, who was not spared in the tomfoolery, liked the Mac SE prank the best, which makes me feel good. For a minute, I thought I was going to walk into work in deep trouble. Thank goodness for good senses of humor. Happy April Fool’s! And happy birthday, Apple! Posted by davelawrence8 at 5:49 pm on April 1st, 2008. 2 comments... » Categories: apple, humor, lowend. 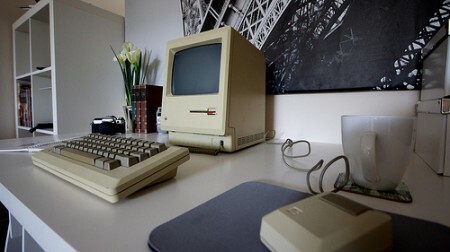 Tags: 1984, apple, april fool's, big brother, birthday, coworker, joke, mac, mac se, macintosh, office, prank, vintage, work. Subscribe via RSS.